This trip, snorkelling only, is clearly more amateurish than the dives, and so attracts a different kind of person. 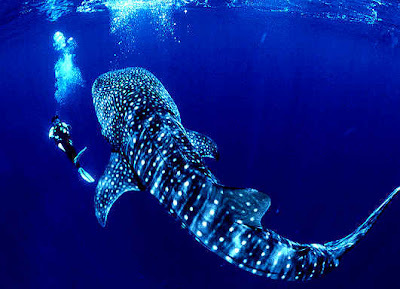 It’s called an Ocean Safari, but the main purpose is to find and swim with Whale Sharks, the biggest fish that exist. Apparently Dolphins are also sometimes seen. We have “Fi” leading us, and we carry our flippers down to the boat, where we launch in the usual way, then are issued with masks on board. The drive out is not long and it’s less than 10 minutes before we find a whale shark. No messing about, I grab my gear and am first into the water, better to get in and sort out flippers and mask once you’re in I say. They tell you to slip into the water to avoid scaring the sharks away. This chap we have is young, so only about 4-5 metres long!! He is very docile though. Initially he swims away from our boat, so I follow him. Reflections from the water surface ripple across his smooth dotted body. He’s so big, with mouth like a hoover, stretched wide, sucking up plankton and small fish that he comes across. The sole living member of its family, the whale shark is the world's largest living fish. Its massive, fusiform body reaches lengths in excess of 14m. It has alternating thin white vertical bars and columns of spots on a dark background, with long ridges along the upper side of the body and a prominent lateral keel. The narrow mouth extends across the full width of its flattened head. The eyes are small and far forward on the head. This shark swims slowly near the surface, consuming small crustacean plankton, small fishes, such as sardines and anchovies, and even larger fishes such as mackerel. The whale shark is found in all tropical and subtropical oceans, along coastal regions, and enters lagoons on tropical islands. It is mostly seen on the surface were divers and snorkelers can swim with this gentle, curious creature. The whale shark ranges throughout the western and eastern Atlantic Ocean, the Indo-West, central, and eastern Pacific Ocean. I can just about keep pace with him, myself and Fi in fact, with the others being picked up by the boat and brought along. Then he turns and heads back to the boat. It would seem he’s interested in us, especially the dual outboard motors which he pauses at and inspects with each loop. Circling round, I follow him. He seems to sometimes swim directly at me, then stops just in front of me, before veering off and swimming past me. It’s fascinating, as if he understands the game, what he’s supposed to do. He dips briefly down a few metres, so I watch from above, before he surfaces. Eventually the other swimmers are getting impatient, having sat on the boat for a while, so I’m told to get back on board. Frankly I could swim about with him all day, but there are some very seasick passengers who I’m sure would not be so happy to wait. We drive around near Tofino Beach, the next beach along, but they find nothing else so drop us for a quick swim on very boring and barren Clown Fish Reef, apparently a training dive. I’ve got a slightly burnt back, despite my suncream. Not good if I’m carrying my full backpack tomorrow, I will suffer! At Tofo Scuba, I pay the bill, which is not bad really. I want to dive more, but had better save myself, or rather my wallet, for later. I do however buy the t-shirt! Sorry, was going to put a photo here but I haven’t got round to taking one. Later, dear reader, check back (if you really want to see!). Tofo for Open Water Course? Is Tofo good for doing your Open Water Scuba Course? To be honest, having been here, I would say on reflection that it is not. Why? Because the shallow stuff isn’t great. 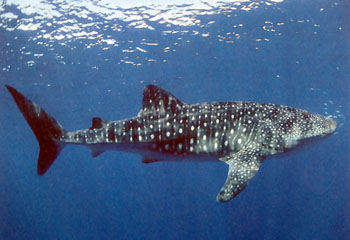 Tofo diving is famous for two reasons – whale sharks and manta rays. Whale Sharks are best seen snorkelling, and the Manta sites are all deep dives, which you need to be Advanced certified for. To learn, you want somewhere with busy reef action which is easily accessible – I think Redang Island where Hedge and I did our Open Water PADI was absolutely perfect – we’d just walk down the beach and swim out to reefs. 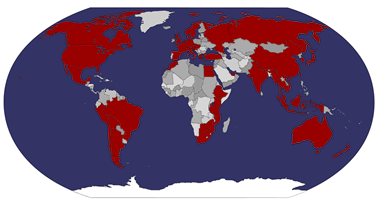 Perhaps further north along the East African coast it’s better – I know the reefs are supposed to be better there. Watch this space! Chatting with Henry and a couple of girls, I finally get my laptop and phone charged! It’s been three days with no real access to power! Can’t cope! Can’t compute! Back to Bamboozi’s to change my mosquito net before reception closes – I’m not suffering again tonight! I find our room is not locked, apparently Sally, the Malaysian girl, has lost the lock, somewhere in the room. She doesn’t know where, so I put my combo lock on the door instead. Next out to Dino’s for another tasty thin-base pizza and a beer, plus Tilman of course, then home for a breezy cloudy (i.e. bearable) night. I’ve decided that tomorrow morning I’m definitely leaving for Vilhankulo. Back at my room I find one of the girls has left the combo lock unlocked. Nice. I sit in my new net, fully mosquito-protected, reading Tilman. Suddenly! The HORROR! A mosquito! In the net!! The mystery is solved. These mosquito nets simply don’t work! How terrible!